Week Two of the preseason kicked off Thursday night with six teams seeing action including the Washington Redskins and New York Jets. Typically, in Week Two, fans will get to see a few more of their favorites. But only for a very limited amount of time. That was certainly the case with the Redskins and Jets. Alex Smith played his first game in a Redskins uniform (4-6 for 48 yards). He just played in the first series of the game—an 11-play, 71-yard drive that resulted in a field goal. A touchdown would have been better, but Washington fans aren’t going to complain. Sam Darnold is not bad: He didn’t look bad but he didn’t look overly impressive, either (8-11 for 62 yards and one interception). You always hope to see forward progress in young players, but it is worth noting that he didn’t regress. So, it may be safe to assume that we have seen so far is not the exception. That doesn’t mean he’ll be ready for Week One. But when he is ready, he is going to be pretty darn good. Teddy Bridgewater better? : All eyes are on Darnold since he is expected to be the future of the franchise. But Bridgewater (10-15 for 127 yards, one touchdown, and one interception) is starting to look like the guy the Vikings thought he was going to be before his knee injury. All the talk has been about whether Darnold should start Week One. Maybe Bridgewater should. Colt McCoy: Why aren’t teams interested in acquiring him? You never hear his name in trade circles. When it came time for him to re-sign with the Redskins he quietly did so. Yes, his starting time with the Browns was a disaster but every time he takes the field for the Redskins, he looks like he belongs, and he gets the job done (12-16 for 140 yards and an interception). Washington’s defensive front: If you like good defensive line play and can appreciate the job the big guys do in the trenches, then you’ll love watching rookie nose tackle Daron Payne and second-year end Jonathan Allen. The former Alabama boys are going to give offensive linemen headaches all year long. Fantasy football players need to keep an eye on Cam Sims and Trey Quinn. Sims is the guy every coach wants at wide receiver (6’5” and 214 lbs) and he did make some plays (three receptions for 57 yards). But he needs to be more consistent. Quinn, this year’s Mr. Irrelevant, may look like someone who is irrelevant for a football team, but he gets the job done (three receptions for 36 yards). Samaje Perine: He left the game after a beautiful 30-yard run and didn’t return due to a sprained ankle. If he can make runs like that on a regular basis, the Redskins will not miss Derrius Guice in the least. They’ll need him to. It’s hard to win games kicking nothing but field goals. 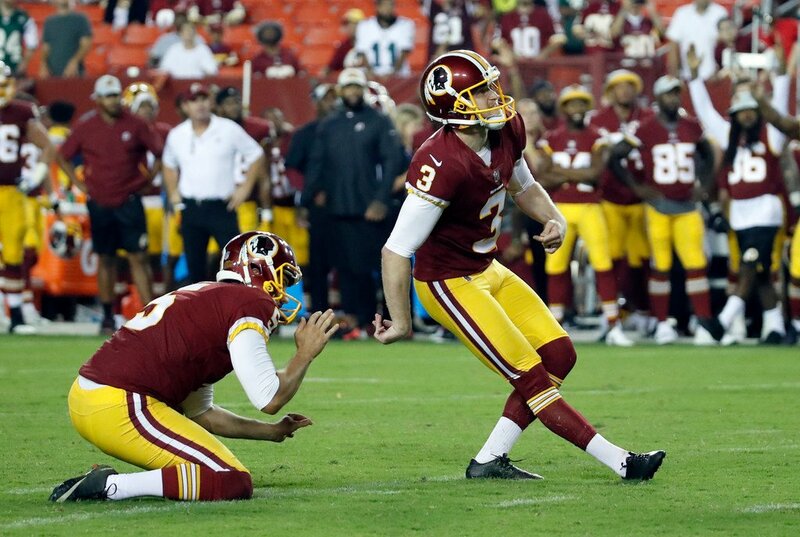 For those who keep score, the Redskins won, 15-13, after making a field goal as time expired. The Redskins will take on the Denver Broncos in preseason action next Friday. For the Jets, it will be their hometown rivals, the New York Giants (also on Friday).